Elliott was inducted into the National High School Hall of Fame on Saturday, July 2, 2005 in ceremonies that took place in San Antonio, Texas. A native of Tucson, Elliott starred for Cholla High School, where he earned three varsity letters. As a senior in 1984-85, Elliott averaged 31.3 points per game and led the Chargers to a 24-3 record and a berth in the Class 5A state tournament semifinals. His 844 points scored and scoring average both were single-season 5A state records at the time. He was a two-time all-state selection and was named the state high school player of the year in 1985. Elliott earned All-America honors from McDonald’s, Converse, adidas and Basketball Times following his senior season. Additionally, he was selected to Arizona’s 20th Century Super Seven team and the Cholla High School Gymnasium now bears his name. Elliott played 12 seasons in the National Basketball Association, 11 of those with the San Antonio Spurs. He averaged 14.4 points per game and closed his career as the Spurs’ career leader in three-point field goals made and attempted, while ranking fourth in points scored. Elliott’s 85 career playoff appearances rank second in franchise history. 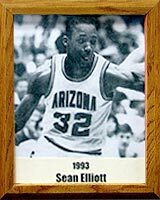 Both the University of Arizona and the San Antonio Spurs have retired Elliott’s No. 32 jersey. He is one of only three Wildcats and five Spurs to have his jersey retired.